To honestly breed genetically and mentally sound Golden Retrievers, keeping in mind the breed standard and the true purpose of this multi-talented breed. 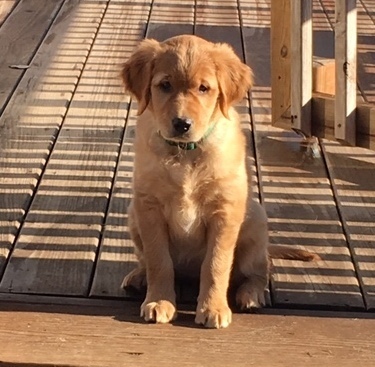 To be responsible for all puppies produced and be dedicated to the education and support of all parties interested in Wynwood Golden Retrievers. 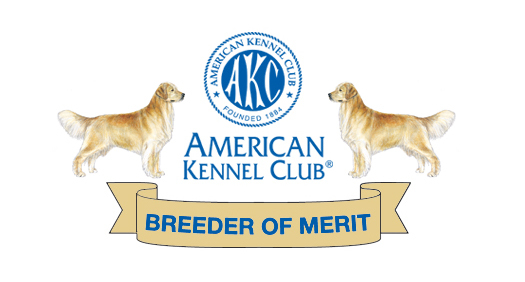 Awarded by the AMERICAN KENNEL CLUB as a Breeder of Merit, for exceptional and outstanding production of quality puppies, along with adhering to the AKC requirements for being a responsible breeder of pure bred dogs. Wynwood has always been a small hobby kennel, established in 1978. It makes Wynwood especially proud to have been the breeder of the American Kennel Club’s 2002 National Obedience Champion – NOC, OTCh Wynwood New Direction UDX. “Turner” was trained, loved and the soul mate of John Brooks of Little Rock, Arkansas. There are very few dogs in the United States to have achieved this honor! Wynwood also set a record by being the FIRST kennel to breed one litter that had four litter mates achieve the AKC Obedience Trial Championship title. Since Wynwoods inception, over forty Wynwood Golden’s have earned their Obedience Trial Championships, many have been Tournament winners and placers and have been rated among the Nationally recognized Obedience dogs/all breeds. In addition, many Golden’s produced at Wynwood, have been honored by the Golden Retriever Club of America as Outstanding Producers and Hall of Fame achievers. Litters of puppies are planned with great thought and preparation. Part of this preparation includes health checks (hip, elbow, heart and eye) on all breeding stock as well as being mentally stable and of correct Golden temperament. Home raised, well socialized, both mentally and physically, puppies are placed with interviewed, appropriate families at approximately 7-8 weeks of age. All puppies are guaranteed healthy and have the most current protocol for vaccinations. Puppies are reserved on a first come basis in regards to the desired goal the purchaser has in mind. Whether it be a family companion, obedience/agility competitor or a field/hunting dog. Wynwood Golden Retrievers are generally bred from working backgrounds, maintaining the most important asset of the breed, as stated in the Golden Retriever breed standard, of ‘primarily a hunting dog’. They tend to be active, athletic, muscular, good looking, with sound structure, of medium size with medium length, easy care coats. They are also very intelligent, people pleasing, family type dogs. Wynwood does not produce a show/conformation type Golden Retriever. A conformation type Golden Retriever is much bigger in size and weight, has a great deal more coat, bone size and head type. Wynwood is dedicated to the betterment of the Golden Retriever Breed.